I am excited, honored, and thankful to be a part of Elite Hoops Basketball and look forward to contributing my blog each week. The goal of my blog is simple; to inspire, to motivate, to influence and to help anyone who is passionate about basketball (and training). I have been a professional basketball strength & conditioning coach for past 10 years and have been fortunate enough to work with some of the best players and coaches in the world. Every week I will share these experiences, along with my thoughts, in this blog. By definition, my job is to get players of all ages and levels faster, stronger, quicker, more explosive, and in great basketball shape. This will reduce the occurrence of injury and improve performance on the court thus allowing you to be the best player you can be. 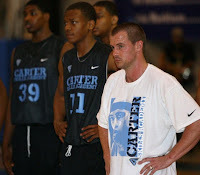 Whether you are a college player, a high school coach, or a caring parent, I am confident my blog will be of value. If you like what you read, please check back at the beginning of each week as well as share my blog with anyone you think would benefit from it. In addition to normal updates, tidbits, and quality behind the scenes insight into the practices, workouts and game plans of the nation’s top players and coaches and teams (like Montrose Christian, currently ranked in the Top 10 in the nation), I plan on really sinking my teeth into deeper topics like leadership, communication, toughness, and competitiveness. I very much welcome any thoughts, ideas, or questions you have regarding my weekly blog, especially if you have an applicable topic you want to see covered in the future. Just drop me an email at Alan@StrongerTeam.com and I will do my best to integrate in. Alan Stein is the owner of Stronger Team and the Head Strength & Conditioning coach for the nationally renowned, Nike Elite Montrose Christian Mustangs boy’s basketball program. Alan brings a wealth of valuable experience to his training arsenal after years of extensive work with elite high school, college, and NBA players. His passion, enthusiasm, and innovative training techniques make him one of the nation’s leading experts on productive training for basketball players. Alan is a performance consultant for Nike Basketball as well heavily involved with Nike SPARQ Basketball. He is the head conditioning coach for the annual McDonald’s All American game, the Jordan Brand All American Classic, and the Nike Summer Skills Academies. Alan is a Camp Coach at the prestigious NBA Player’s Association’s Top 100 Camp as well as the Chris Paul CP3 Elite Backcourt Camp. Alan has filmed over a dozen DVD’s on improving performance and is a sought after lecturer at basketball camps and clinics across the world. He has been featured in Winning Hoops, Time Out, Dime, SI.com, SLAMonline.com, American Basketball Quarterly, Stack, Men’s Health, HOOP, and FIBA Assist Magazine.